People, it has got to stop. 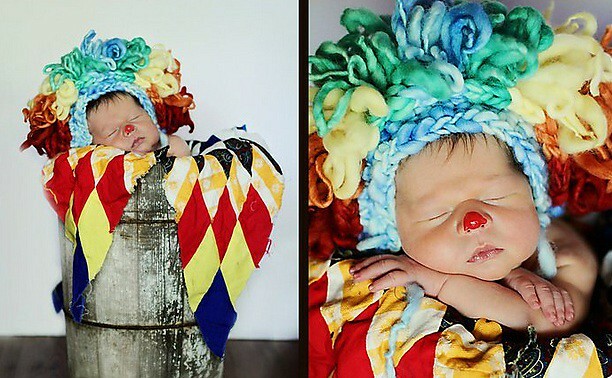 This whole "dress up a sleeping newborn in whatever weird stuff we can think up because they're little, can't stop you and sleep a lot" is just wrong. It's the baby equivalent of writing all over your friend's face when he's passed out drunk. It's just plain mean. Don't tell me this kid isn't going to be gunning for whoever did this to him/her later in life. Yep. I'll agree on this one. It's pure fugly. Nothing's better in a baby photo than... nothing! he's going to be the emo kid who hates his parents for sure! What mystifies me is how is it possible to take a sleeping baby and pop it into a barrel without waking it?? Would never have happened with my kids. This is cruelty to babies. I want to see the BABY, not the ridiculous get up you stuck him/her in. Save the crazy outfit for Halloween (when at least it makes SENSE). At the very least, coordinate the wig and the quilt, people. Clashing only makes cruelty to babies worse. Okay - I can sorta see the whole clown thing... but why did they put him in what appears to be a garbage can??? Poor kid. I have a million dollars (well, not really) that says he develops a phobia of clowns. I like cute kid photos but please ick! Poor kid! I'm with Cathy. How to you take a sleeping baby, dress it up, put red on its nose, and then put all of it in an aluminum bucket? HOW? I think I remember Nicole from Stash and Burn saying that they feed the babies right beforehand and turn the temperature of the room way up. (In an episode from around February?...) Then the babies get really sleepy, and the parents ignore the brief feelings of guilt before abusing their newborns. Ugh! That is so wrong, wrong, wrong!